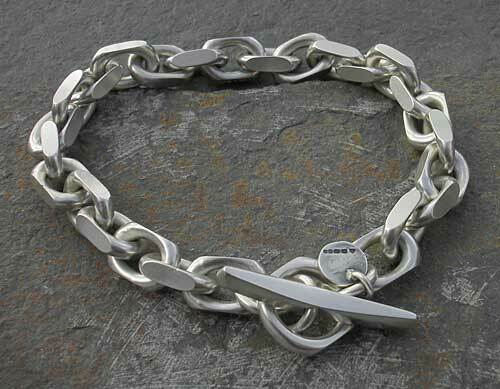 Men's Chunky Silver Chain Bracelet : LOVE2HAVE in the UK! 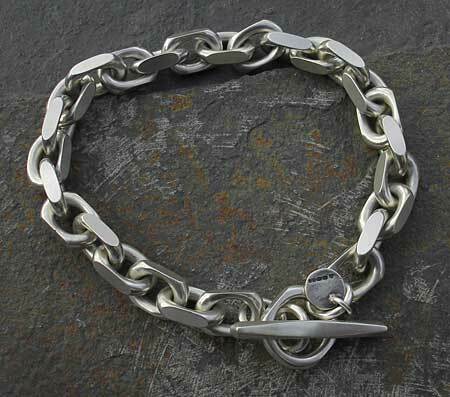 A chunky handcrafted men's chain bracelet made from solid sterling silver with a T-Bar fastener. This piece is an excellent example of men's silver chain jewellery that is very different to anything found on our high streets. The links have a very industrial look about them that suits men's jewellery. This piece is proving to be one of our most favourite men's bracelets, and we also feature a textured version too. It is available in lengths of 8 or 8.5 inches, so please state your choice of size in the comments box at check out. Each link measures 12mm x 9mm. However, we can accommodate any length if you want. The total weight is 50g. Size(s) Available: 8 1/2 inches as standard.